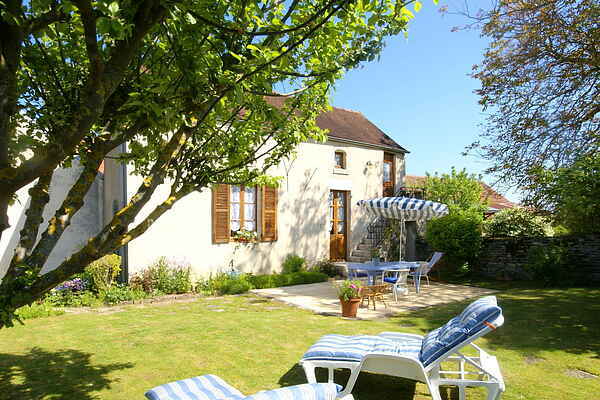 This detached holiday home is nestled snugly at the edge of the tiny Marcenay (1km). In this property, which has been renovated with careful attention, the authentic details are just waiting to be discovered by you. You will have access to an enclosed courtyard, fantastic for a game of boules (petanque)! At the rear is a walled grass garden, complete with shady tree and patio furniture. Right next to the garden is a secluded, private terrace, connected via a few steps. There is also a sandpit (sandbox). There is a tennis court, supermarket, and bakery in Laignes (4km). In this hilly, wooded area, it is lovely to stroll and, of course, picnic. Countless bird species seem to feel perfectly at home here. If you love culture, then a visit to the Gallo-Roman ruins at Versault (12km) must not be missed. This also applies to the castle in Ancy-le-Franc (25km), the Abbey of Fontenay (34km), and the medieval Vix with its famous vase (13km); hotspots that must not be left off your list! Châtillon-sur-Seine (14km) is a charming town with shops and outdoor cafes. A great place to stop and recover from long walks or bike rides.